In recent years, Americans have become frustrated with the troubled relationship between religion and politics: an exclusive claim on faith and values from the right and a radical divorce of faith from politics on the left. Now a new generation of religious leaders is re-envisioning religion in public life, leading grassroots movements to go beyond partisan politics to work for a more just and inclusive society. Progressive & Religious tells the dynamic stories of these leaders. 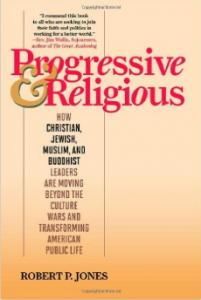 Through nearly 100 in-depth interviews with Jewish, Christian, Muslim, and Buddhist leaders, this book explains how they are tapping the deep connections between religion and social justice to work on issues like poverty and worker’s rights, the environment, health care, pluralism, and human rights. Interviewees include David Saperstein, Michael Lerner, Jim Wallis, Brian McLaren, Feisal Abdul Rauf, Eboo Patel, Kecia Ali, Lama Surya Das, Robert Thurman, and E. J. Dionne. Order the book and add PRRI as your Amazon Smile nonprofit organization.